Okay, guys – I don’t hold many giveaways on here but now’s your chance! This (just like my Times Square New Year’s Eve VIP stint) is courtesy of Pepsi and their Refresh Everything campaign. They’re also sponsors of NFL Rookie of the Year. The package is worth $250 and perfect to help you host your own Super Bowl XLIII party on February 1st. Or just keep the schwag to yourself! I won’t tell anyone. This contest will end January 26th, when I’ll pick the winner through a drawing. Entering is easy. Just email me your name andÂ shipping addressÂ atÂ estarla [at] att dot net. Put “Super Bowl Party Pack” in the subject header and you’re set. If you win, Pepsi will ship you your party pack directly! 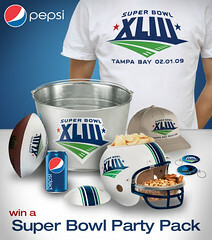 This entry was posted in Events and tagged giveaway, party pack, pepsi, refresh everything, super bowl xliii. Bookmark the permalink.